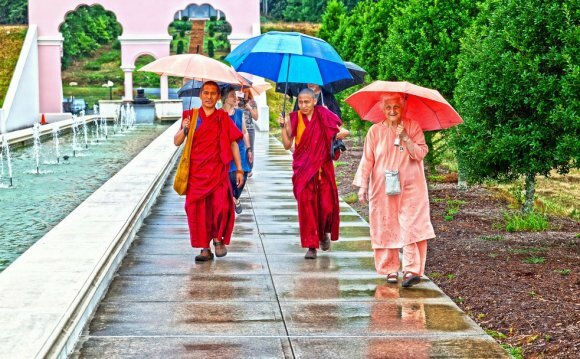 The Lotus Conference Center is located on 750 acres of tranquil countryside in Central Virginia, at Satchidananda Ashram-Yogaville. Sitting high atop an overlook, the Center offers magnificent views of the Blue Ridge Mountains and the James River. The Lotus Conference Center provides accommodations for twenty two people in private, semi-private, and dormitory-style rooms. Larger groups can arrange for additional space in other Yogaville facilities located on the property. All the rooms are comfortable and modern, some with private baths. The Center is available for private retreats and workshops, church meetings, and family celebrations (including graduations, engagements, weddings, baby blessings, anniversaries and family reunions).